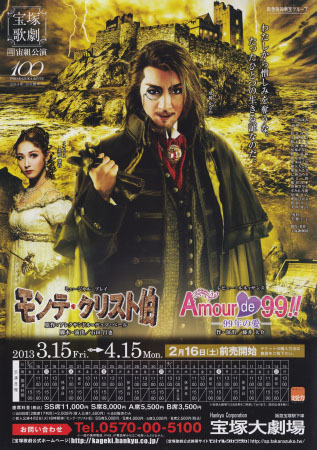 The Count of Monte Cristo / Amour de 99! Edmond Dantes, a young sailor from Marseille, is being dragged in chains to the Chateau d'If, a state prison. He protests his innocence, but the jailors laugh and torment him before locking him up in solitary confinement. A few short hours before, Dantes had returned to Marseille from a voyage at sea and been reunited with his fiancée, Mercedes. Her father, Pierre Morrel, promoted Dantes to captain as a wedding gift to the couple. Into the middle of this celebration came the soldiers to arrest Dantes. He is sure he has done nothing that is against the law, and promises Mercedes he will return soon. Then abruptly we realize that the story is being narrated by a bunch of high school kids, who are studying the book "The Count of Monte Cristo" in order to do a play. In their squabblings about dramatic interpretation, the kids summarize the more complicated parts of the story. Apparently Mercedes's cousin Fernand Mondengo, who is not so secretly in love with her too, once applied to her father for permission to marry her, and thus to become captain of one of Morrel's ships. Upon being refused, Fernand poisoned the captain of Dantes's ship, the Pharaon. Dantes, meanwhile, has been taken to the public prosecutor's office. The prosecutor, a young man named Villefort, sympathizes with Dantes and asks him several questions, who answers them freely. On orders from his old captain he stopped at Elba to pick up a letter from Napoleon. He was told that a man named Noitier would come to him to collect the letter. Villefort becomes very nervous on hearing the name Noitier, but laughs it off and says it is best that the letter not go through to the Bonapartists. He burns it. Then the soldiers come and arrest Edmond again. Shocked that Villefort could change face like that, he breaks away and escapes. After running through the streets, Edmond comes to the old drinking haunt of Fernand and his no-good friend, Danglars. They sit him down, promise to help him, etc. Fernand rings the bell for the waitress - and summons the soldiers. Dantes stares at the two in disbelief. As the soldiers drag him away, he begs them why they would betray him. Fernand coolly replies that he wants Mercedes. Danglars wants money for drink. It turns out that Fernand and Danglars have a bit of an in with Villefort, because they know Villefort's father - the man Noitier - is a Bonapartist. Danglars is also a bit of a womanizer and is interested in Villefort's wife, Heloise. When Mercedes finds out that Edmond has been taken to the Chateau d'If, she falls into despair. The prison is notorious, much like the Bastille, for the fact that very few people get out of it. She begs Fernand for help to try and get Dantes out. Fernand promises easily, because words are cheap and that way Mercedes will rely on him. The years pass slowly by for Edmond in the Chateau d'If. He sees no one except the jailors, who brand him once a year on the anniversary of his arrival. When he can't sleep he thinks longingly of Mercedes. As the time passes, he falls into listless despair. A year later, we see that back in Marseille, Fernand has finally convinced the heartbroken Mercedes to marry him. They have a son, named Albert. But when Albert is only a few years old, Mercedes learns that Fernand keeps the company of other women. She turns more and more to raising Albert, who she thinks of as Edmond's son even though she believes Edmond to be dead. One day, an old man tunnels into Edmond's cell, hoping he has found an escape route. Back in the old man's cell, the two talk. Both have been in the prison for a long time. The old man's name is Abbe Faria. He is a priest who used to be secretary to Cardinal Spada, and was imprisoned by people who wanted to steal the Cardinal's fortune. He encourages Dantes to keep believing in God, and to try to maintain hope. Dantes scoffs at him at first, but softens over the next few years as the old priest educates him. Together, they make escape plans. Faria eventually dies of old age. When the guards come to take the body bag, they are surprised that the old man was so heavy, but throw the body into the sea. In a more cheerful corner of the Mediterranean, pirate/smuggler captain Luigi Vampa and his mixed crew of Europeans and Muslim sailors are transporting their cargo. Bertuccio, one of the men, is caught stealing lemons. There is talk of throwing him overboard, stranding him on an island, etc. Vampa has kind of a soft heart, though, so he lets Bertuccio ashore at the island of Monte Cristo. (Not sure if Vampa already knows Dantes is there). Once in the employ of Dantes, who now calls himself the Count of Monte Cristo, Bertuccio is shocked and excited at how much money and treasure the count has. The Count reveals that he doesn't care for the money, except as the means to a very specific end: the ruin of the people who sent him so unjustly to prison. He lists them. Fernand Mondengo now Count Morcerf and a general in the French army. Villefort, who is now high up in the judicial system and very wealthy. worked together to build their fortunes through hiding each other's misdeeds. There is one other person who the Count thinks of with extreme bitterness. Bertuccio is rather taken aback. Surely it isn't right to take revenge against a woman, Monte Cristo snaps at him that his job is to obey orders. Some months later, a grand party is held in Paris. Bertuccio, in the role of major domo, greets the guests and answers a few questions about the mysterious Count of Monte Cristo, who has just arrived in Paris from Italy. He is fabulously rich, keeps a bevy of beautiful Arabian slave girls, and speaks little about his past. Danglars is sure he can get some money out of the Count. Villefort and Fernand also plan to benefit. Fernand and Mercedes barely get along in public - they are only partially able to hide their quarrels from Albert, now a young man and an officer in the French army. Albert introduces his friend Franz, who is engaged to Villefort's daughter Valentine. The Count of Monte Cristo makes a grand entrance, a beautiful veiled young woman on his arm. He recognizes Albert, whom he met in Rome, and Albert introduces him to his friends and the others. When Albert presents his mother, Countess Mondengo, Mercedes has a terrible shock. The Count is wearing a necklace made of Tiger Eye beads, identical to one Edmond had, and identical to one he had given her right before his arrest. The count says he found it washed up on a beach, probably from some drowned sailor. As the dancing commences, the count asks Mercedes to dance. She is chilled by some of the harsh things he says, but he apologizes. They separate with very mixed feelings, at least on Mercedes' part. After the ball, Bertuccio comes to Dantes and tries to persuade him that he should take Mercedes off his list of people to get even with, arguing that she isn't happy with Fernand, there might have been extenuating circumstances, etc. Bertuccio is a big softie, and he is growing increasingly concerned that Dantes is going to become a heartless monster bent only on revenge. Luigi Vampa, now also in Dantes employ, sets about some events that end up ruining Danglars' bank. The family flees, but Danglars is caught by Vampa's crew and imprisoned. They make him pay exorbitant prices for food and drink, and finally sell him a pistol to kill himself with - that doesn't have any bullets. The Count of Monte Cristo enters and asks Danglars if he recognizes him. Danglars tries to protest that it was mainly Fernand and Villefort, but Dantes says he doesn't want excuses. Danglars has had a taste, now, of what he had to endure. He tells Vampa to release Danglars - the banker is crazed now and harmless, his family destroyed. Dantes begins to wonder what he has set in motion, but continues anyway. His next target is Villefort. He gets an anonymous letter saying Madame Villefort has been poisoning people, and may kill his daughter, Valentine. He shows the letter to his wife, who brushes it off as a ridiculous accusation. As a test, Villefort dumps a glass of wine she brought him into a fishtank - the fish promptly die. He draws a pistol and accuses her. Valentine is shocked, but Villefort protests he's trying to protect her. He shoots Heloise. However, the house servants, all Monte Cristo's men, have witnessed it. The count enters in disguise as Abbe Busoni, but reveals himself to Villefort. Fearing jail, Villefort shoots himself. Bertuccio again tries to reason with Dantes. Look at the misery he has caused, both for Danglars' family, who were innocent, and for Valentine. Dantes seems to modify his plans: He will take out Fernand, but leave Albert and Mercedes. Fernand goes to a restaurant, where he meets an old man with a gray beard. The entertainment is in the form of a play: a Turkish ruler, Ali Pasha, had a wife and daughter who were sold into slavery by a man he trusted. Fernand gets somewhat nervous about this, but is reassured when the old man says he has brought the woman Fernand is interested in. She is veiled, but Fernand recalls dancing with her at the Count of Monte Cristo's party. When he stoops to kiss her hand, she pulls back and reveals a scar on his wrist. Fernand has no idea why she is interested in it. She removes her veil and asks if he recognizes her: She is Haydee, Ali Pasha's daughter, and Fernand betrayed her father and sold her and her mother into slavery. The old man reaches over and deliberately rings a small bell. Fernand realizes in horror that the old man is familiar to him. Dantes takes off the disguise and hands Haydee a pistol. "Go ahead and shoot him," he says. Haydee tries, falters, and then lets Fernand go. Her maid is distraught and asks her why she wouldn't. Haydee says there is more to life than revenge, and admits to Dantes that she is very fond of him - but that he cannot be bitter forever, even though his sweetheart married another man. Fernand is now disgraced and on the run. Albert is convinced that he needs to fight a duel with the count, who ruined their family and the families of his other friends. Mercedes tries to talk him out of it, but cannot convince him. Failing, she goes to the count herself. Seeing Edmond without his former disguise, Mercedes recognizes him instantly. She begs him to call off the duel, protesting that Albert is young, he is her only child, the only person she still has to love. She can't believe that Edmond, who once loved her, would be willing to kill her child. She tells him of the misery of her life with Fernand, her regrets, her sympathy for him. Edmond starts to feel torn - to give in to Mercedes, or to have his revenge. He conquers himself and goes to leave. Mercedes snatches a sword from a suit of armor and attacks him. He defends himself with his cane, reluctant to hurt her, but still warring with his distaste for her betrayal. He tells her to stop, but she won't - she is desperate to protect Albert. Finally moved by the depth of her mother's love, Edmond lets his cane drop and turns to her. "Kill me, then - for Albert's sake." Mercedes hesitates, then goes to stab him. Inches from his heart, she can't bring herself to do it. "I can't kill you because I still love you." She bursts into tears. Edmond moves away from her. He says he will fire into the air, sparing Albert. More gently than before, he bids Mercedes goodbye and leaves her. Albert and his friends arrive early to the duel. One of his friends, a photographer, is horrified by the whole notion of killing people. Albert himself is a bit emotionally unsteady, but insists he's ready. Dantes arrives with his seconds, some of his Arabian servants. They go through the formalities, and the two men take their positions. Just as they are about to fire, a woman's voice screams "Stop! Albert is your son!" Bertuccio sort of prods Edmond to go over. He says something about Albert's gotten so big... Albert calls him "Father" and Edmond hugs him. There is actually a pretty strong resemblance between them. Bertuccio then turns Edmond toward Haydee. He starts to speak, but she gently turns him around and pushes him toward Mercedes. She puts their hands together. They stand there awkwardly for a few moments, trying to get up the courage to smile. Then abruptly there is a shot. Mercedes cries out and falls to the ground. Edmond and Albert rush to protect her. The gunman is Fernand, who has followed them and wants revenge on Mercedes now, even though he was false and cruel to her. As he is about to fire again, police run in and shoot him dead. Mercedes is not really hurt - it was just a glancing blow. Everyone kind of fades into the background, leaving only Edmond with her. He takes her in his arms, and they both cry a bit. Then everyone seems to live happily ever after, since Edmond and Mercedes are finally going to get married. Final performance for Maika Kurumi and Yumeri Miko. Created by psychoteffy. Last Modification: Sunday 17 of June, 2018 08:43:47 PDT by tallae.